Terraco is proud to provide innovative and environmentally friendly finishing materials to the construction industry. 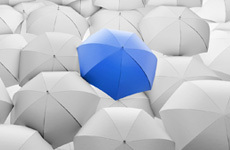 Promoting health, ensuring comfort and improving energy efficiency have been paramount since its founding in 1980. You are guaranteed a sophisticated finish when using the products from a leader in the formulation, design and production of green materials. Exterior Insulation Finishing Systems (also referred to as EIFS, ETICS, EWI) thermally wrap a building to preserve a building's heat and reduce temperature fluctuations. An ideal solution for renovation as well as new build, using a wide range of decorative textured finishes. A unique acrylic based filler, ready-mixed and easy to use. The perfect solution for filling, jointing and skimming. 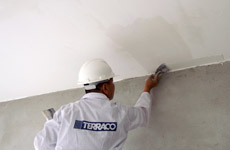 Terraco Sprayplaster is a unique acrylic based filler for interior walls and ceilings. 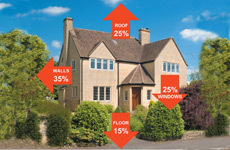 Sprayplaster is the solution for fast track projects where time and money are key. A range of waterproofing products of distinction and durability with a wide range of diverse waterproofing solutions that are suitable for above, below and at ground level application.